The planned new configuration of Madison Ave between Allen Street and, eventually, Lark Street. The Albany Police Department announced this week that the posted speed limit on the section of Washington Ave from Jermain Street (basically the overpass over Rt 85) to the I-90 Exit 2 ramp will be changed from 45 mph to 30 mph as of this Friday, August 19 at 9 am. As the department said in a press release: "The Albany Police Department will also have units on patrol in this corridor for the purposes of traffic safety education and enforcement." That section of Washington Ave is the stretch along the the Harriman State Office Campus and UAlbany's campus. And there's been a lot of development along there over the past few decades -- the Patroon Creek office park, a bunch of hotels, and now a new private dorm across the street from UAlbany with another one in the works. The dorms alone will probably prompt some increased pedestrian activity along there. Lowering the speed limit should make the situation marginally safer. But it wouldn't be surprising if the design of the road -- currently two lanes in each direction -- eventually becomes a point of discussion. Also announced this week: There will be paving work on the section of Madison Ave between Allen Street and Partridge Street this Friday. And then on Monday and Tuesday the new striping for the Madison Ave Road Diet project will be going down on that stretch. As you might remember, Madison Ave -- currently two lanes in each direction -- will be re-striped so that it's one lane in each direction with a center turn lane and a bike lane in each direction. Traffic is already horrible in this city let's just make it worse. Try getting out of downtown Albany at rush hour. It takes hours some time to get home. Granted there areas that need to be evaluated for safety. But reducing roads that carry a majority of the traffic into and out of downtown Albany from two lanes to one lane will only cause more traffic problems. Not to mention it might be more difficult to pass a CDTA bus that is stopping every block. There is a reason why that area of Washington Ave has a 45 MPH limit it is because it is well enough away from the residential section and it doesn't have pedestrian walkways, meaning you shouldn't be walking there. Just like Washington Ave Ext. has a higher speed limit. I would hope APD would be more lenient when before they hand over your ticket when they pull you over in the new 30 MPH zone. Maybe everyone that needs to actually get some where should get on I-90 after work...oh, wait. But it wouldn't be surprising if the design of the road -- currently two lanes in each direction -- eventually becomes a point of discussion. Yep, that needs to be narrowed if we expect anyone to go 30. Isn't it 55 near Crossgates, on Wash. Ave. Extension? THat's gonna cause some headaches. This will immensely benefit the local budget. Cops will have no problem fulfilling their monthly ticket quota. @N - obviously you have not been following the analytics on road diets, particularly the Madison Ave project. They state quite the opposite of your assertions. No left turn lanes/lights and buses stopped in the travel lane. This is going to cause increased congestion, especially during peak hours. There won't be anyway to pass people going below the speed limit, or busses, without going into the turn only lane. Crazy idea - stay with me here - If you are annoyed by your commute in and out of Albany, consider that you are the problem. Albany's roads are not exclusively designed as your conduit to and from work. Consider moving closer to work and/or taking public transportation. That CDTA bus you are so eager to pass is carrying 50x more people than your car. Population in this region is growing and there are only so many extra routes that can be constructed. Commutes will get longer and more congested. Ed - I can believe Madison ave would benefit from road diet. It is a downtown street with lots of left turning traffic clogging the street when 4 traffic lanes a shoehorned in the space good for 3.5 lanes. Even then benefits of road diet actually depend on being able to sync traffic lights. As a side note, looks like DOT gave up on syncing 3 traffic lights along Washington ave. ext. after about a year of efforts. I am not betting on them doing any better with Madison. 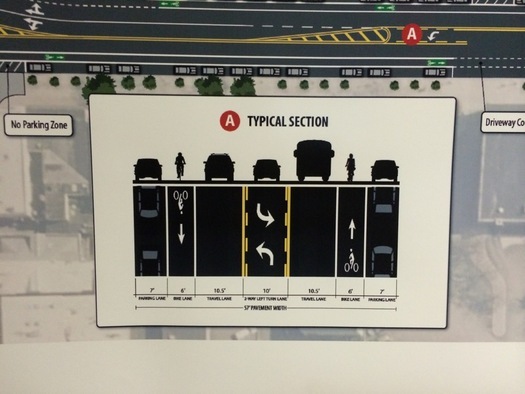 With that - Washington ave by SUNY is 4+ lanes, with dedicated turn lanes so it will not benefit from diet. THere is a lot of traffic in that area - in fact Fuller-Washington roundabout was build because of backups in the area. Things are a little bit better by now, since there are fewer people in state office campus. If at least some redevelopment plans actually come true, area would be a parking lot even with 4 lanes. Either Rt. 85 access need to be improved, or some other highway access be established. Now, building dorm at that location was a crazy idea. Crossing 7 lanes of traffic several times a day is not the way to go. But you should not expect any thoughtful planning in NY. Build a monstrous roundabout for $15M, move people who should use the road to a different location, eliminate the road, and plan for more development? Sounds like Albany to me.. I can't wait for the road diet to extend all the way to Lark, and I'm not even a cyclist. Ideally Central would get the same treatment. There's no doubt in my mind that with a dedicated turn lane and actual bus pullouts, traffic will be moving faster than it does now. AOA has tons of good info on the planned design, N, check out the links in the article. Daniel - population in the region is growing, but population of inner cities - Albany, Troy - is not. Do you think that is an indication of a problem extending beyond commuters? While Iâ€™m a strong advocate for the Madison Road Diet, as they say, the proof of the pudding is in the eating. It is one street, so letâ€™s try this out. I know all the car slaves are tearing their hair out, befuddledly drooling at the bit because how dare Albanians reclaim their roadsâ€¦but patience folks, patience. First off, the most expensive part of the project (milling and paving) is out of the way. If advocates like me are dreadfully wrong, and car slaves are proven to be right, slap some new paint onto that asphalt, forget it ever happened, and go back to the way it was. However, the pudding has always been good to eat in almost every other community who has executed a road diet. Secondly, please car slaves, please read the plan before you decry it. Bus pull outs will be weaved into the diet, so no, you will not be stuck behind a bus; in fact, the bus (filled with 20-50 passengers, based on my typical commute) will be stuck between the curb and you (a passenger of one) idling at the light. What year did Niskayuna/Schenectady implement the road diet on State Street? Central Avenue is two lanes with a turn lane in each direction, then becomes State Street and changes to one lane in each direction with a turn lane, from the 'Mansion' plaza to McClellan Street. I remember hearing about the impending traffic apocalypse, but don't think it came to be. Other people who drive that every day at rush hour may have a different opinion, but I think the traffic is much worse through Colonie. Mike- You are in error. Populations of all three of the Capital Region's cities has risen. Up at least 5,000 people since 2000. These are facts that you can look up. Thanks, Anthony, I was going to point out that developers wouldn't be pouring millions of dollars into housing in Albany if there wasn't a market for it, but I didn't bother to look up the actual numbers. While census estimates happened to be off before, this is the best data we can get - and it shows slight decline. Troy was specifically mentioned in the comments to latest data release as a city which fell below 50k in 2014-2015 (50,129 for 2010 census, 50,005 for 2014 estimate and 49,906 for 2015 estimate. Albany _county_, on the other hand, shows fairly consistent growth - Guilderland and Bethlehem are doing good. Mike, that misses the point entirely. These cities declined for half a century. A reversal of that, regardless of how small, is significant. Especially when it's put up against all the machinery to encourage suburban development that's been in place for the same amount of time. Making cities more than just conduits to move commuters to and from the suburbs will encourage more people to live here, which is the point of all this. That said, yeah, the 30mph speed limit is absurd on a highway, which is what that part of Washington Ave is. As for a Washington road diet, I'd think the best spot would be east of Brevator. But a similar redesign of the highway to Brevator's west is necessary if we really want a 30mph city street. JayK - my point is that the growth trend slowed down, if not reversed over past few years. That said, do those long streets _need_ to be small city streets or better use them as arterials to enable flow of traffic? You consider roads a liability - but I would think about them as an asset for the community. Again, the city is for much more than moving traffic. Traffic does best when it moves slowly and allows the rest of us a life outside of a dirty metal box. Cars contribute nothing to a city and detract greatly. So yes, a focus only on them is an enormous liability.